The son of the renowned Florentine painter, Domenico Ghirlandaio (1449 – 1494), Ridolfo carried on this Florentine style of painting. 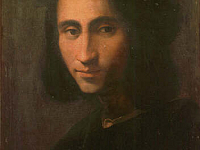 Domenico died when Ridolfo was only eleven years old, leaving his training as a painter to an uncle, but more prominently with the influential Fra Bartolomeo (1472 – 1517). His works between 1504 and 1508 show a marked influence from Fra Bartolomeo and Raphael (1483 – 1520), with whom he was friends. From Rome in 1508, Raphael asked Ridolfo to join him; but the painter stayed in Florence and became one of the city’s prominent painters of altarpieces, frescoes, and portraits. He painted vast scenic canvases for various public occasions, such as the wedding of Giuliano de' Medici (1479 – 1516), and the entry of his cousin Giovanni di Lorenzo de’Medici as Leo X (1475 – 1521) into Florence in 1515. In his prime he was honest and conscientious as an artist; but from about 1527 he declined, having already accumulated a handsome property, more than sufficient for maintaining in affluence his large family of fifteen children, and his works became comparatively mannered and repetitive. Among his masterpieces, mostly works in oil are: Christ on the road to Calvary, now in the Palazzo Antinori, an Annunciation in the Abbey of Montoliveto near Florence, the Coronation of the Virgin from 1504, a Nativity and a predella in the Oratory of the Bigallo in Florence with five panels representing the Nativity and other subjects. In 1514, on the ceiling of the Chapel of St. Bernard in the Palazzo Pubblico, Florence, a fresco of the Trinity, with heads of the twelve apostles and other accessories, and the Annunciation; also an Assumption of the Virgin, who bestows her girdle on St Thomas, in the choir loft of Prato cathedral. Towards the same date, a picture showing his highest skill, replete with expression, vigorous life, and firm accomplished pictorial method is, St. Zenobius Resuscitating a Child and a Translation of the remains of Saint Zenobius, also The Virgin and various saints, at San Pietro Maggiore of Pistoia. In 1521 he executed a life-sized work of the Pietà, at S. Agostino, Colle di Val d'Elsa. Towards 1526 he completed the Assumption, containing his own portrait. He also painted an excellent portrait of Grand Duke Cosimo I de' Medici in youth, as well as A Portrait of a Young Man, now in the Uffizi Gallery. In 1543 he executed a series of frescoes in the monastery of Santa Maria degli Angeli. In the National Gallery, London is The Procession to Calvary. 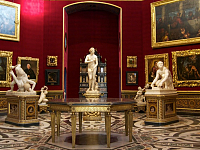 A great number of altar-pieces were executed by Ghirlandaio with the assistance of his favorite pupil, Michele Tosini (1503 – 1577), who due to his mentor acquired the name Michele di Ridolfo.